Cilantro is one of those herbs that you either love or hate. We love the fresh taste that it imparts to fresh side dishes like guacamole and salsa. Leaves are best used fresh but are sometimes dried and ground with their seeds. Both seeds by themselves and this ground mix are referred to as Coriander. Whole seeds are often added to spice blends where they impart a subtle citrus tang. They can be added to savory dishes or sweet ones. Pudding Spice is a traditional English blend that includes not only Coriander seeds but also cinnamon, allspice, cloves, freshly grated nutmeg and ground ginger and is used to flavor pudding. 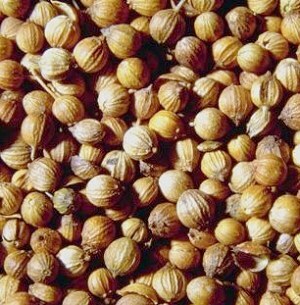 Coriander seeds also make an appearance in the North Indian spice blend Garam masala. Here it is mixed with cumin, cardamom, black peppercorns, cloves, mace, bay leaf and cinnamon. Cilantro is a cool weather annual which should be planted in spring as soon as frost is no longer a threat. It fares best where springs are long and cool. Summer temperatures can cause the plant to flower before it gets to a harvestable size. If seeds are desired, leave the flowers on until the seed pods turn brown. 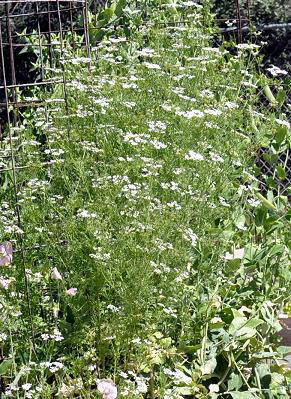 The flowering Cilantro plant above is about four feet high. Once Cilantro starts to flower it stops making leaves and the leaves left become less and less tasty. 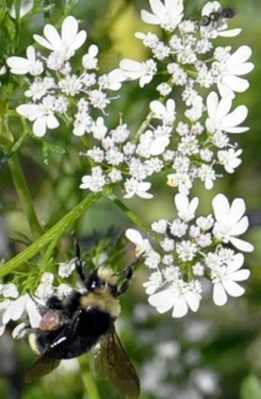 Normally this would be the time to devote this garden space to another plant, but we let this Cilantro flower to attract beneficial insects, and produce seeds. As the seeds turn brown, they can be harvested to use as Coriander. If, however, they are left on the plant, they will fall to the ground and more Cilantro will grow at the appropriate time of year. Seeds of Coriander fall into two groups or varieties. Large fruited varieties or C. sativum MACROcarpum are also referred to as C. sativum vulgare. These seeds are usually grown in warm climates like Morocco. Smaller fruited varieties are C. sativum MICROcarpum. (Please note the capitalization is for clarity). These varieties are grown mostly in colder climates like Russia and Northern Europe. Cilantro makes a great addition to our Small Space Herb Garden Six Pack. This plant is sometimes available in plug trays. These trays hold 128 of all the same plant. They are a great low cost way to fill a lot of space. Each cell is 3/4 of inch by an inch. Check here to see if Cilantro Plug Trays are available.